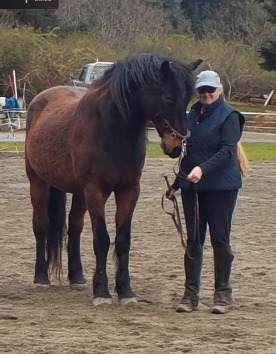 Horses want a good leader, but how do youLearn how to greet and introduce yourself to horses in the way that will fosters trust and sets the stage for leadership. Lessons can include grooming, walking in harmony, introduction to working on line (with a halter and rope) or at Liberty (free in the arena). 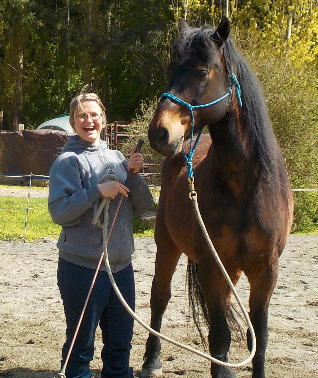 We will discuss how to tell what the horse is thinking, and how help you and the horse feel more confident through better understanding of one another. This two day retreat will open up the doors of communication between you and one of the mustangs. 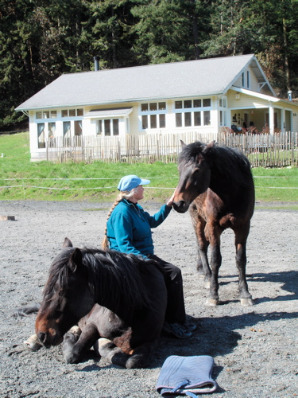 You will learn the Rituals that horses use in the wild to build relationships and herd harmony, to promote mutual understanding through clear communication and how to establish leadership. While some may call this 'Horse Whispering' I see it as 'Horse Listening'. Like yoga or meditation, these guided exercises will teach you to focus, to listen to your intuition and to work in harmony with the horse. .Step by step you will be guided through a series of exercises which will build upon one another to establish you as a leader. You will also have the chance to watch others in their process and participate in the group discussion of the experience. Your relationship and understanding of horses will grow in leaps and bounds, and you will most likely have insights into your other relationships as well! Does your horse sometimes through his head up, or bolt or freeze? Is he stiff and hard to turn or stop? Is he sluggish and feel heavy on the forehand? Does he seem unbalanced or flighty? Most horses have never been helped to learn how to carry themselves, let alone a rider. Most horses are started in a way that insists that they move at a trot and canter long before they can even balance themselves on a lunge line or a round pen. Most riders have never had the chance to learn another way. BUT, there is another way! It starts with simple ( but not easy!) work on the ground helping the horse stretch, relax and begin to strengthen himself in preparation for a rider.